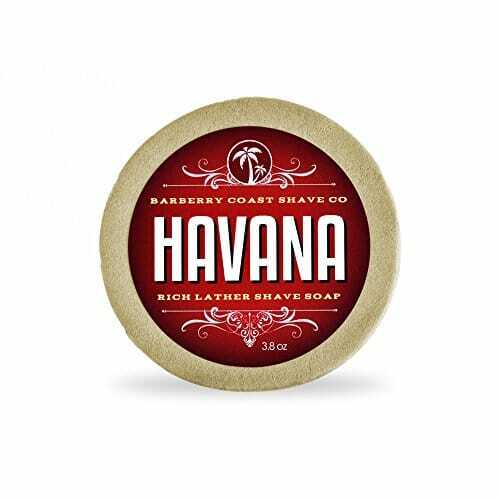 Barberry Coast Shave Co. presents Havana Shave Soap. A reverent nod to the old time tradition of wet shaving with a mug and a badger hair shave brush. Enter a seductive, exclusive world of members only night clubs with this intoxicating blend of opulent tobacco leaf, and crushed cocoa beans that is reminiscent of old Havana charm and glamour. Creamy island vanilla laced with natural oils of patchouli and Peruvian clove leaf add a touch of spice and mystery to this gentleman fragrance that will not leave that special someone unaffected. We scented our soap with the highest grade of Barberry Coast’s uniquely masculine scent of a proprietary blend of extracts, absolutes and essential oils – free of all synthetic fragrances, dyes and preservatives, you never have to worry about what chemicals will do to your skin. Made with Shea Butter, Soy and Coconut Oil this shave soap will develop into an amazing, rich and thick lather that provides excellent glide and cushion whether you use a Double Edge Razor, Straight Razor or Cartridge Razors. Rich, Thick & Slick Lather For a Smooth & Irritation-Free Shave. Experience The Most Enjoyable Shave. Will NOT dry out or irritate your skin… guaranteed. Leaves your skin smooth & moisturized. Large puck will last 3-6 months. Net weight of 3.8oz & lasts longer than most larger shaving creams. Completely Safe for Your Skin. No Toxins, Parabens or Synthetic Chemicals. Vegan & All-Natural. Upgrade your shave with this luxurious shaving brush. Not only its larger than regular shaving brushes it’s bristles are made of the finest pure badger hair. With dense natural bristles it creates rich lather for a perfect shave. Bristles has unique gold color tip which gives this brush a truly stylish look for classy gentlemen. The badger hair bristles get very soft when soaked in warm water. High water retention with dense bristles creates very rich lather. Naturally exfoliates and massages the skin and prepares your face for the perfect close shave. Badger brush gets underneath your beard and mustache allowing shaving products to further penetrate and soften. Use with your favorite shaving soap, foams, gels or creams. Beautiful shaving brush for classy gentlemen who like traditional wet shaving ritual. It’s a great gift for your father, husband, boyfriend, brother, grandfather. Wet shave brush. 100% PURE BADGER HAIR BRISTLES – The quality of our bristles are unmatched. BRV MEN shaving brushes has very dense bristles. Unlike our competitors we don’t use any mix-hair, grey hair or black hair and call it pure badger brush. This is the real badger hair shaving brush. Amazingly bright and beautiful color. LUXURY BADGER BRUSH – 24mm knots top-end luxury shaving brush with heavy resin black handle for comfortable hold. High water retention with dense bristles. 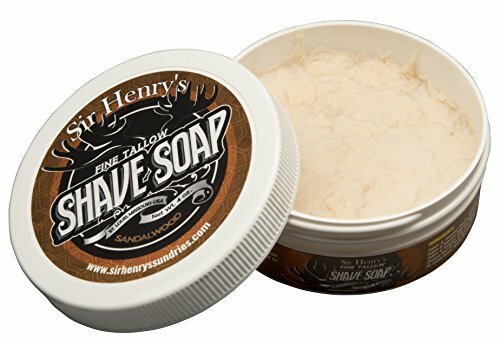 Creates rich lather for perfect wet shave. Use with your favorite shaving soap, foams, gels or creams. Perfect for thick, glossy lathering, easy to clean, and quick to dry. QUALITY SHAVE – The natural bristles get very soft when soaked in warm/hot water. Naturally exfoliates and massages the skin and prepares your face for the perfect shave. Use it with Double-Edge Safety Razor or Straight Razor. Badger hair shaving brush. Professional grade. FOR MEN – We have created this beautiful shaving brush for classy gentlemen who like traditional wet shaving ritual. It’s a great gift idea for your father, husband, boyfriend, brother, grandfather. Mens shaving brush. 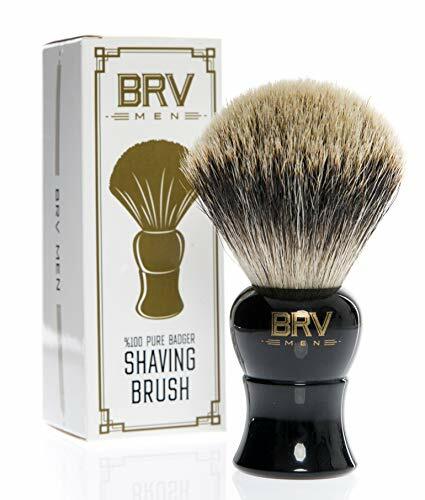 100% MONEY-BACK GUARANTEE – BRV MEN shaving brushes are backed by 100% guarantee that you are fully satisfied with your product or receive your money back. We want to see a smile on your face. Buy with confidence. We work hard to provide you with the best badger brushes at an affordable price. Shaving brushes for men. Welcome to Bigfoot Shaves, home of the greatest razor known to Bigfoot (and man) kind! For over a hundred years, soldiers, movie stars–even presidents shaved with a classic brush, bowl, and single or double blade razor. Bigfoot Shaves’ classic old-school shaving set will take you back to an era when men were men. Today men all over the US and the world are throwing away “modern” razors and re-discovering a classic shave. Save Money & the Environment! Shaving cream has to be bought frequently when using the “modern” gimmicky plastic razors, but puck soap used for wet shaving can last years while maintaining its quality. Whether you’re just transitioning to the classic safety razor shaving system or are a pro that has been using it for years, you’ll save money with the long lasting quality of both our products and the close shave provided. When it comes to razors, cheap plastic ones give you razor burn and barely last a few shaves before you have throw them away. Cartridge razors cost a fortune. They shave great in the beginning, but you have to keep increasing the blade count to get good shaves. In addition, the multi-blades get clogged after a couple of shaves. YUCK! The EPA estimates that 2 billion plastic disposable razors end up in landfills each year in the USA alone. Bigfoot Shaves razors and blades contain no plastic and are 100% recyclable. Perfect Gift for Every Gentleman! This shaving kit makes an excellent gift for all occasions: Father’s Day, Birthday, Christmas, Valentine’s Day, Anniversary, and much more. Every man deserves gentle exfoliation and superior lathering for a clean shave every time. That is what Bigfoot Shaves delivers! TRUE WET SHAVE: The Bigfoot Shaves badger hair shaving brush delivers a true wet shave, as its high water retention brings the water to your face. This style of shaving softens and raises the beard as you lather, so that your shave is smooth and comfortable with no pulling, giving you a salon quality shave each and every time. 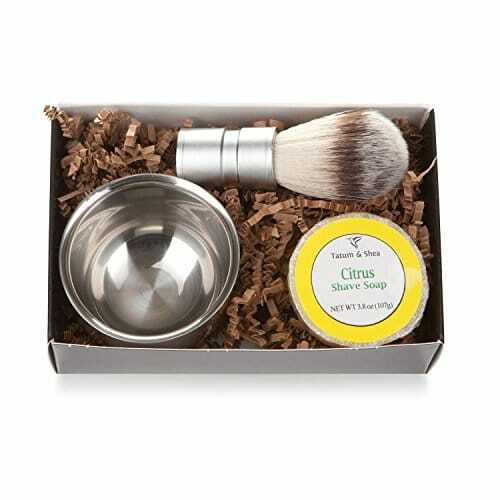 This set includes a premium stainless steel mug along with a badger hair brush. With high-end shaving accessories you can sculpt, shape, and shave like a professional. 100% BADGER HAIR BRUSH: Here is the ultimate shaving tool addition that works with all facial hair types. This shaving brush is designed with a high-quality wooden handle and densely distributed, 100% badger hair bristles. Authentic badger hair is ideal for wet shaving as it is firm enough to keep its shape for proper lathering while being soft enough to be comfortable and gentle on the skin, unlike boar hair and synthetic brushes. GENTLE EXFOLIATION: The enhanced design and quality of our shaving brush allows for gentle exfoliation that is essential to a superior shaving experience. The brush and bowl combo is used to create a rich warm lather with your shaving soap, preparing your skin and beard for a shave free of nicks, cuts, and razor burn. BIGFOOT SHAVES PROMISE: We are on a mission to deliver the greatest shave possible with our high performance razors and accessories. This shaving accessory set is a must-have for all modern gentlemen. The outstanding retro brush will deliver a barbershop lather, exfoliation, and shave each and every time. GBS manufactures high-end grooming tools and accessories. Proudly offers high quality craftsmanship and exquisite style at an affordable price. Creates a rich creamy lather. 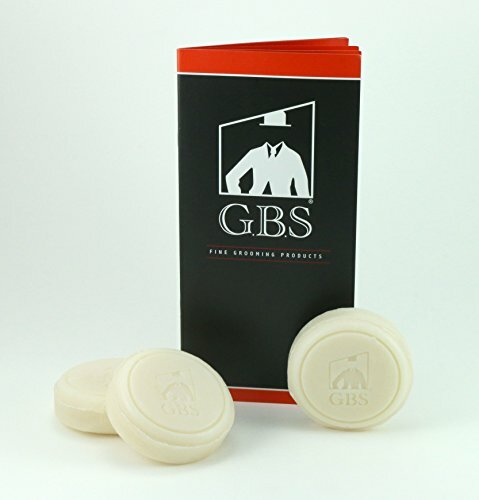 GBS signature shaving brushes are also available! 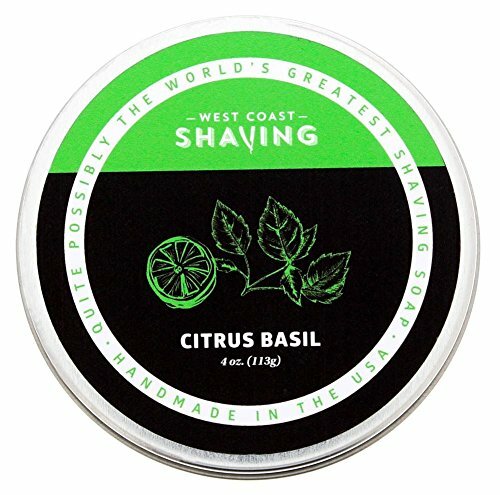 West Coast Shaving, Shaving Soap, Citrus Basil. Rich Lather, Smoothe Comfortable Shave. For Men and Women. lUXURY SHAVING SOAP – Lathers effortlessly and provides superior cleansing and protection for your face during a shave. br> The verticle bars keep your brush sliding towards freedom while the horizontal ridges catch the soap between the brush bristles and create a thick lather ready to be smothered all over your face. br> The ceramic quality feels heavy (but not too heavy) in your hands and performs as one would demand from a shaving mug. Some would say it sings delight. Not too heavy that you can’t handle it in the shower while holding your shaver in the other hand-not too light that it feels like a pansy. br> Ok, let’s review what you get from Savanna . . .
br> Horizontal bars & verticles-create some tension for lather 10 oz chamber-for filling with hot water Environmentally friendly cork-dry rot resistant A walk like McGregor + a damn good shave . . .
br> Our customers absolutely love this mug . . .
br> Your brush stands in this mug with the handle perfectly above the rim (see photo above). br> You won’t need to lick your fingers or go find the cat to wipe them off. br> The handle remains dry . . .
br> Which means you can whip up a lux lather without banging your brush handle like Ringo Star on the rim. Any drummers out there? No fear of cracking the rim or brush handle with this shaving scuttle-saving you the hassle of cleaning up the mess and your wife stepping in broken ceramic in the bathroom. A stainless bowl (available in our Stand Kit) allows you to shake out excess moisture and add save your shaving puck for your next shave. br> Personally, I just remove the water and leave the soap in the scuttle. Works for me but for those of you that want to keep the soap dry then remove it and add it to a soap dish. HOT SHAVE WITH TOASTY LATHER: Heavy duty porcelain retains temperature longer in this shave mug. Lather your favorite soaps and creams directly in your new mens shaving mug, and enjoy a hot shave, just like at the barber shop. Everything you need to wet shave, this shaving mug set comes with a Naked Amor shave brush and our organic shaving soap for an excellent experience. Buy this shaving scuttle mug set today! THE PERFECT SHAPE & SHAVE: A wide lip and short sides are perfect for lathering shaving your favorite wet shaving soap or cream, right in the black shaving mug. No more banging the sides as you move your brush along the ridges. The Naked Armor shaving cream bowl creates rich lather foam like a magic cream experience that Jimmy Hendrix would have been proud of and could have written a song about. He would have called it the perfect scuttle mug or scuttle bowl depending on who you ask. EASY-TO-USE DESIGN: The convenient thumb-on-top handle technology allows you to lift and hold your shaving scuttle mug at any angle you want while dipping the brush into a warm lather for several passes.Twist, turn, and dip your brush into your black shaving bowl to get every bit of lather you need-your scuttle will remain warm well past your shave. Our unique design will be your favored shaving lather bowl-you’ll never go back to cold shaving cream again. YOUR LIFETIME & MONEY BACK GUARANTEE – We are sure you will love this shaving bowl set and our warranty is simple and straightforward. If you don’t like it for any reason we will offer you a full refund. Naked Armor shaving scuttle have kept thousands of men (and their women) happy with awesome looking faces made for touching and looking great. You new shave mug will bring a smile to you face every day-we promise. Ready for a closer, more comfortable shave? Our premium natural shaving soap gives you exactly what you need: thick, creamy lather & skin-softening emollients. 3.8-oz. puck is handmade in America. Are you a guy who prefers shaving the time-honored way? Or a woman looking for the perfect “guy gift”? 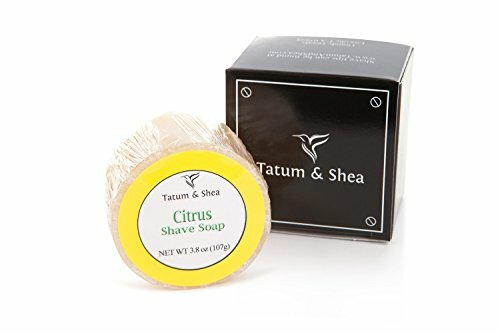 Either way, you’ll want to check out this shave soap from Tatum & Shea. Handcrafted in small batches, it contains only the finest ingredients, such as palm oil, coconut oil & shea butter. So, you can rest assured it will nourish & hydrate without drying, chapping, or chafing. Ideal shaving soap for sensitive skin. Forget those “cakey” bar soaps, with their thin & skimpy lather. Your Tatum & Shea vintage shaving soap lathers like a dream. Simply wet your shave brush with hot or warm water. Then rub the wet bristles over your soap with a firm, circular motion. In no time, you’ll have plenty of warm, foaming lather, ideal for the perfect shave. With its rich texture & nourishing ingredients, this classic men’s shaving soap makes a perfect birthday, holiday & graduation gift. Plus, it’s an ideal shave-soap refill for an existing men’s shaving kit. Stock up today… for yourself & all the guys on your gift list. Richer, Thicker Lather: Go ahead. Mix this classic men’s shaving soap with hot (or even warm) water. In seconds, you’ll have plenty of creamy lather for a closer, more comfortable shave. Naturally Nourishing: No harsh, irritating chemicals. Your 3.8-oz. shave soap contains shea butter, palm oil & coconut oil… so it soothes & hydrates your skin, leaving it calm & refreshed. Handcrafted in America: It’s made in small, artisanal batches under strictest quality control. Rest assured you’re getting the finest men’s shave soap… the gold standard of shaving supplies. Clean, Manly Fragrance: Forget that cheap, smelly aftershave, with its overpowering scent. 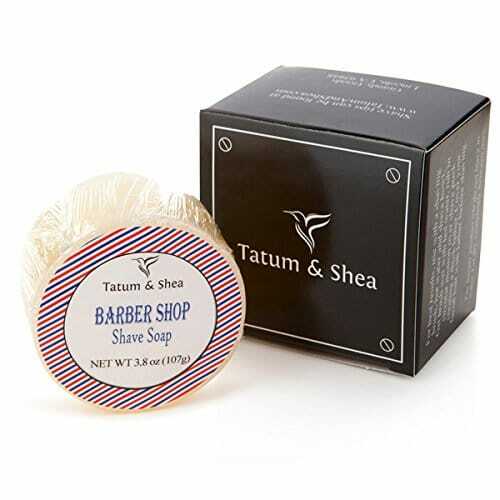 Your Tatum & Shea scented shaving soap has a fresh, subtle fragrance, sure to please your significant other. Attractively Gift Boxed: Know a gentleman who prefers shaving the old-school way? Give him Tatum & Shea vintage shave soap. Perfect birthday or holiday gift. Great shave-soap refill, too. MENS SHAVE LATHER Our flagship Rich Anti-Aging Shave Lather infused with Golden Seaweed is scientifically designed to help reduce and eliminate, nicks, cuts, and razor burn leaving your skin smooth and hydrated. WHY IT WORKS SO GOOD: Dramatically reduces cuts, nicks, scrapes and razor irritation. It gives you the closest, most comfortable, longest lasting shave. It leaves your skin astonishingly soft and smooth. 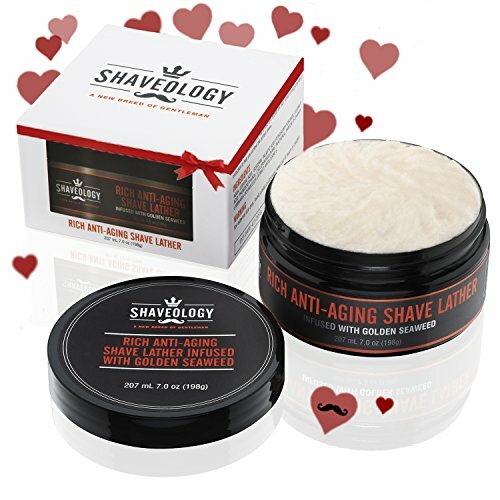 The Shaveology Shave Lather is a revolutionary breakthrough in men’s skin care. By combining the finest ingredients designed to nourish the skin during the shaving process we have also added a new element of anti-aging to our line. By infusing Golden Seaweed to our formulation not only have we made sure the skin is hydrated, but that the skin is protected throughout the day from the free radicals that negatively impact our skin. Manufactured in the USA – BACKED BY OUR 90 DAY LOVE YOUR SHAVE GUARANTEE – If for whatever reason you (or the person receiving the kit as a gift) are not 100% SATISFIED then we will refund your money back no questions asked. That is how confident we are that this really will be the best shave of your life. GET READY TO EXPERIENCE THE SHAVE OF A LIFETIME!- Makes a rich, luxurious lather that you can’t get from most other shaving creams and gels. Find out why our customers are raving fans of Viking Revolution and experience our commitment to the best customer experience possible! MADE OF NATURALLY DERIVED INGREDIENTS- Contains plant based ingredients and has a great Sandalwood Scent. Contains natural oils that help soften and moisturize your skin.LASTS AN INCREDIBLY LONG TIME- One tin can give you months of luxury shaving. INCLUDES BOWL MAKING LATHERING EASY!- No need to buy a separate bowl like with most other soaps.100% SATISFACTION GUARANTEE- Go ahead and add it to your cart now! If for any reason you’re not completely satisfied, just let us know and we’ll take care of it. GET READY TO EXPERIENCE THE SHAVE OF A LIFETIME!- Makes a rich, luxurious lather that you can’t get from most other shaving creams and gels. Find out why our customers are raving fans of Viking Revolution and experience our commitment to the best customer experience possible! MADE OF NATURALLY DERIVED INGREDIENTS- Contains plant based ingredients and has a great Sandalwood Scent. Contains natural oils that help soften and moisturize your skin. LASTS AN INCREDIBLY LONG TIME- One tin can give you months of luxury shaving. No need to buy a separate bowl like with most other soaps. 100% SATISFACTION GUARANTEE- Go ahead and add it to your cart now! If for any reason you’re not completely satisfied, just let us know and we’ll take care of it. 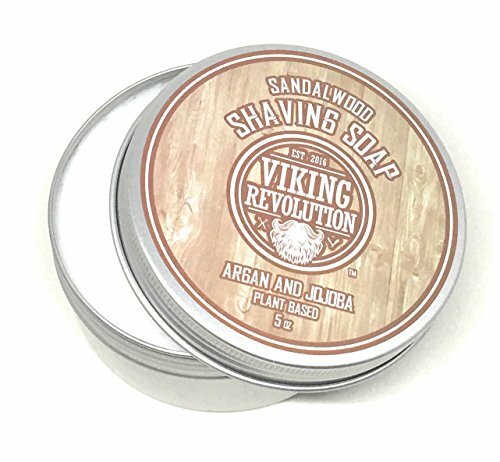 ADD YOUR SANDALWOOD SHAVING SOAP TO THE CART NOW! Ready for a closer, more comfortable shave? Our vintage shaving soap kit gives you everything you need: rich, natural shave soap; luxe stainless-steel shave bowl; plus ultra-soft shaving brush. The heart of the set is the soap… not the usual skimpy bar soap but a thick, 3.8-oz. puck with rich, buttery texture. Handcrafted in small, artisanal batches, this premium, vintage shaving soap contains nourishing natural ingredients, such as coconut oil, palm oil & shea butter. So, you can rest assured it will hydrate your skin without chafing or drying it out. Simply wet your shaving brush with hot water. Then rub the moist bristles over your shave soap with a firm, circular motion. In no time, you’ll have plenty of warm, foaming lather, ideal for the perfect shave. Perfect Shaving Gift Set: Whether you’re a guy buying for yourself or a gal buying for her man, you’ll love this premium shave kit, with its luxe soap, stainless-steel bowl & top-quality brush. Rich, Lathery Shaving Soap: No more thin, skimpy foam. When you use our exclusive shave soap with hot (or even warm) water, you’ll get plenty of thick, creamy lather. Soothes & nourishes skin. 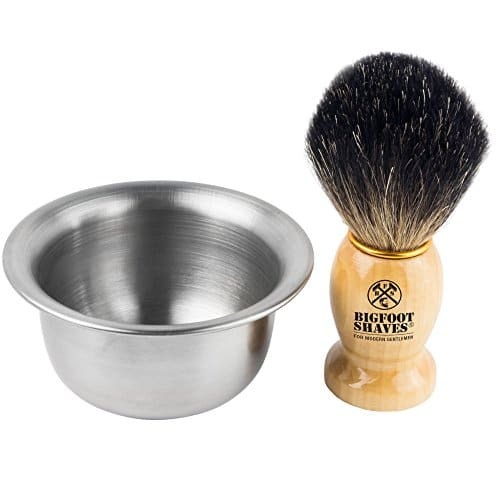 Stainless-Steel Shaving Bowl: Crafted of 2-layer stainless steel, this durable shave cup keeps your shaving soap handy & your lather comfortably warm. Polished for glossy shine. Has nonskid bottom. EZ-Grip Shaving Brush: Even when you’re shaving in the shower, this soft-bristled shave brush won’t slip out of your hand. Simply grasp the grooved steel handle for a secure, comfortable grip.